On Tuesday we were treated to a very special day out. A couple of months ago a crisp white envelope dropped through our letterbox and inside was a silver embossed invitation, inviting us to a wedding planners hospitality day at Goodwood House. It was an invitation we couldn’t turn down, having seen stunning photographs of the venue we were delighted at the prospect of viewing the house and boy were we spoilt! 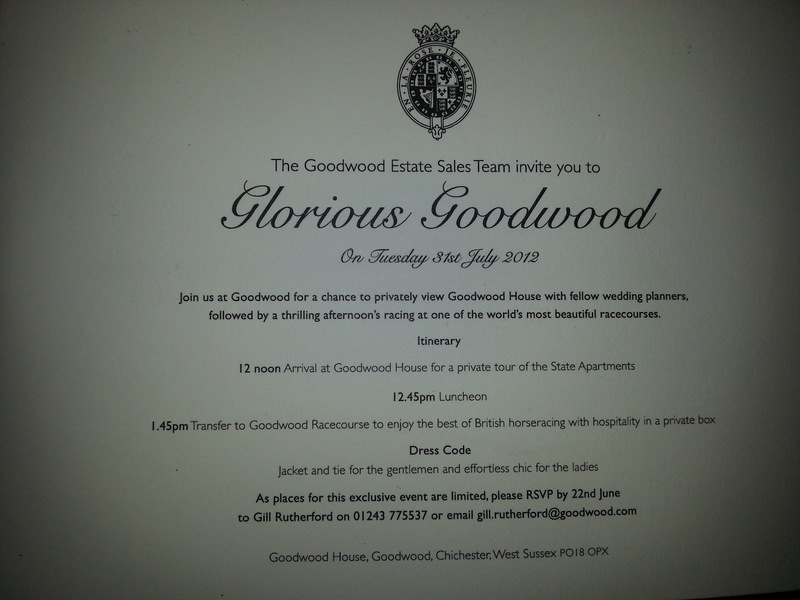 Our invitation- we loved the dress code of ‘effortless chic’! Coming down the driveway we were wowed by the impressive Goodwood House. The building from the outside is simply stunning, a very grand Jacobean stately home. Having said this our view was slightly interfered with by a traditional Carousel which was on the lawn right outside the main entrance! We were greeted by Jill and her lovely team of staff at Goodwood house and were straight away treated to a glass of Champagne. After a quick introduction we were then told it was time for us all to have a go on the carousel- and what fun it was! It took me right back to my childhood although Melanie wasn’t sure that she had ever been on a carousel before even as a child so it was a new experience for her! Shocking I know! 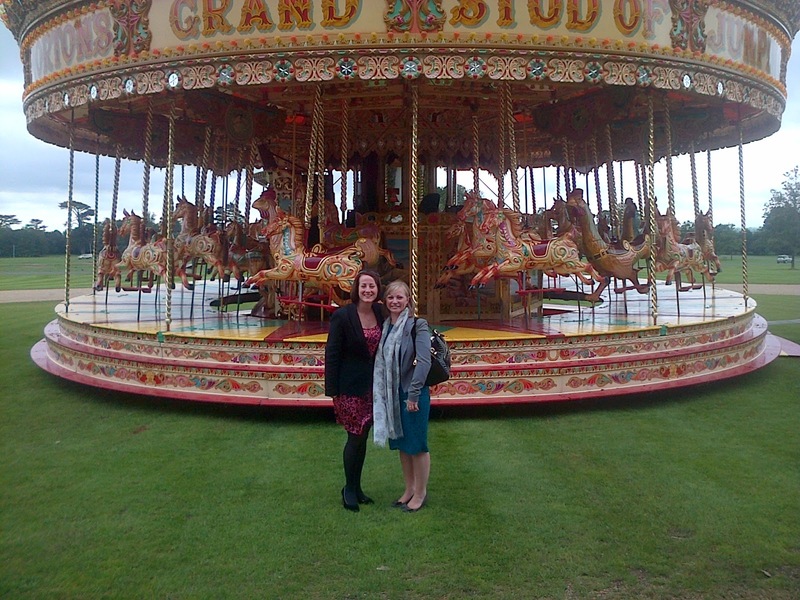 Being ladies we sat side saddle, going round and round and taking in the breathtaking views of the Goodwood Estate. The day also gave us chance to meet some of our fellow wedding planners from around the UK and catch up with a few old friends from the industry. We love meeting our fellow wedding planners and hearing all about the weddings they have been working on. Then it was on to the educational part of the day. The tour of the house was stunning! Our guide gave us a potted history of the house whilst the house manager gave us details of how each room would be used for a wedding. The front hall opens out onto the front lawn for sunny days and is a fabulous space for a drinks reception. The dominating marble columns are a stunning feature and the paintings of the local hunt give the room real character and tell the house’s story. For a perfect winter wedding the roaring log fires can be lit to create a cosy atmosphere. We were then led through to the ‘old’ part of the house which looks out over a small courtyard and lily pond and the beautifully landscaped gardens. The room was filled with amazing portraits and paintings including two paintings of The River Thames and Whitehall which were painted by the famed artist Canaletto. The detail was phenomenal and they looked exactly like photographs. This room could be used for the wedding breakfast for up to 80 people but more often than not, the room is opened up for the drinks reception to allow guests to wander around and have a look at all of the paintings and furniture. 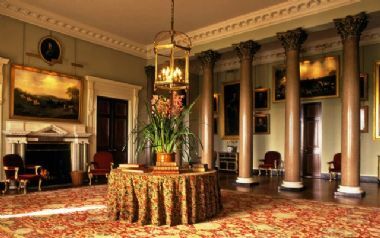 The Tapestry room leads off of this room which your guests are also welcome to walk around during the drinks reception. 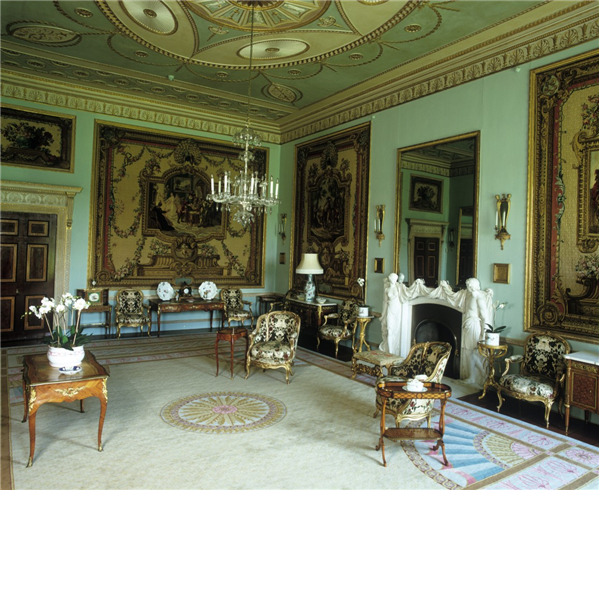 This room is home to stunning tapestries given to the Duke of Richmond who owned Goodwood house in the late 17th Century by Louis XV. The very regal Ballroom was jaw dropping. 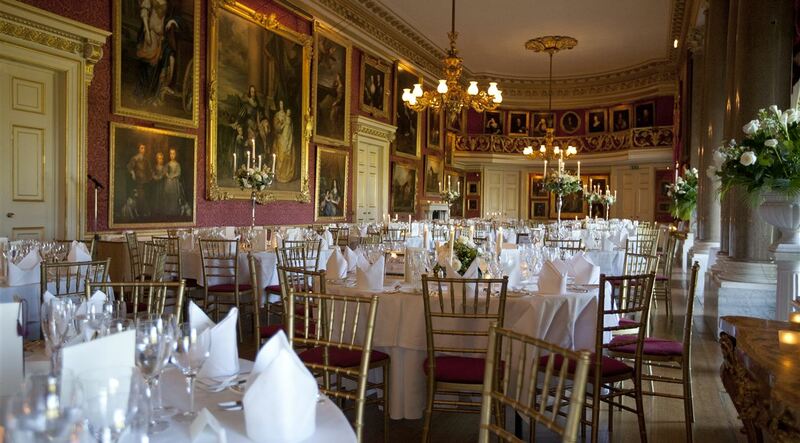 The Ballroom is the most common room used for wedding breakfasts and can seat up to 180 guests. At one end was a huge mirror which adorned the whole end wall, reflecting the room back whilst at the other was the minstrel’s gallery which would be the perfect space for a string quartet to play whilst enjoying your wedding breakfast. The spectacular red and gold colour scheme gives a very opulent feel for your reception. 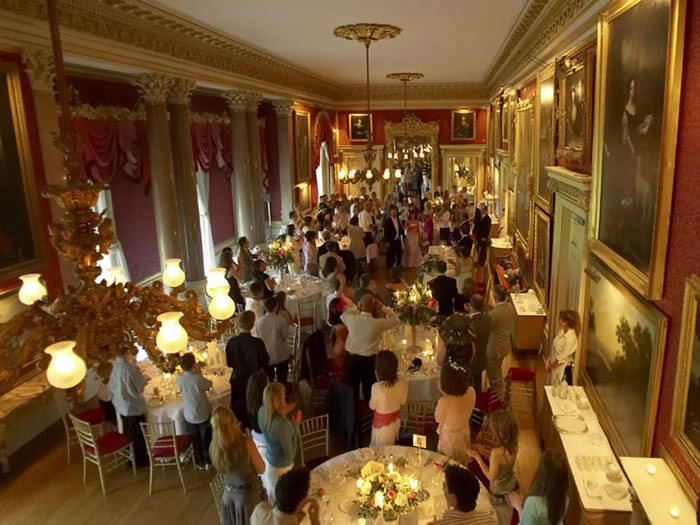 The Ballroom opens out onto the Supper room which is a stunning setting for dancing in the evening. View of the Ballroom from the Minstrels Gallery- great photo opportunity! Whilst the Egyptian dining room is licensed for civil ceremonies, as stunning as the yellow marble walls are, it could be considered a bit of an acquired taste. The Yellow Drawing Room was designed as the grand reception room and is the most popular room to take your vows. The walls are covered with gorgeous rich yellow silk and the room can seat up to 150 guests for a ceremony. The Yellow Drawing room is also the perfect setting for your wedding breakfast and can seat up to 80 guests. 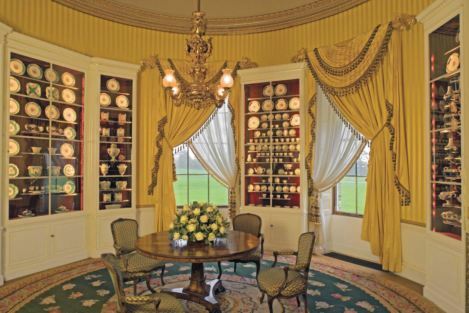 Coming just off of the corner of the Yellow Drawing room is The circular Card room. 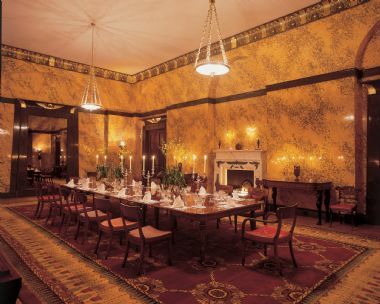 This is where the gentlemen would have retired to play cards after dinner and is now home to a stunning set of Serves blue and green porcelain dessert service. This room is ideal to sign the registers of marriage as it allows the Bride and Groom a few private moments alone together. The space also serves well as a place where the Bride, Groom and Bridesmaids can safely keep their belongings and retreat to for a few moments to themselves. After the house tour we were treated to a fabulous sit down meal meal where Melanie was head of the table! The fresh local food was just delicious! The waiting staff poured our wine and water and offered us freshly baked bread that was still warm. The main of Pan fried lamb rump, potato gratin and garden pea fondue with thyme jus was incredible. This was followed by Spiced roasted pineapple with bourbon vanilla iced parfait and mango which was divine whilst all the time the attentive waiting staff refilled our glasses with wine and water. This was all finished off with coffee and petit fours. 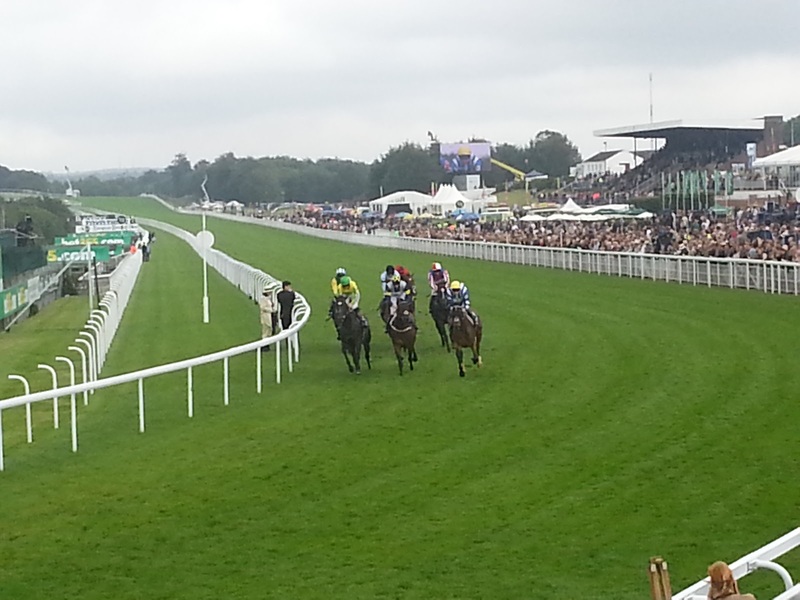 As if seeing the spectacular house and being treated to a delicious lunch wasn’t enough, it was then time to enjoy a taster of the races at Glorious Goodwood! We were transferred to the racecourse in a private car and were escorted to the Richmond enclosure to our own private box! I did say we had been thoroughly spoilt! Our box looked directly over the pathway where the runners were led out onto the course and back after the race so we had prime seats. We were also the box closest to the course itself and so had a fabulous viewpoint of the finish line. On arrival we were again greeted with a glass of champagne and wandered out onto the balcony to enjoy the view. Now it was time to get serious and place some bets- its all part of the fun of a day at the races! We decided to take it seriously and not just pick the horses which we liked the colour of the jockey’s silks so I spoke to a friend of mine who writes for the Racing Post who gave us some tips for the afternoon’s racing. Confidently we placed our first bets and excitedly watched the first race. Despite our tips from a very good source, we didn’t win! In fact Melanie’s horse came last. Our luck didn’t improve over the course of the afternoon, not one of our horses won. And unbelievably, every single one of Melanie’s horses came last! Not even the horse named ‘Sand and deliver’ who we thought might bring us luck with the Beach Weddings Bournemouth connection came through! Part way through the afternoon we were treated to afternoon tea which consisted of a selection of sandwiches, homemade sausage rolls, homemade scones and homemade bakewell slices. It was very indulgent after our delicious lunch but we couldn’t resist! OK so we didn’t win any money but its the taking part that counts right? We still had fun cheering our horses on and congratulating the few of us in our box that did win. Overall we had a fantastic day so a big thank you to all of the staff at Goodwood House who looked after us so well. The house was beautiful, the food delicious, the races fun if not lucrative, the company great and the staff were wonderful. We can’t wait to go back- hopefully to plan a wedding there!